CO2 effects are one of our most popular hires and we pride ourselves in having more equipment available to hire than any other UK hire company. 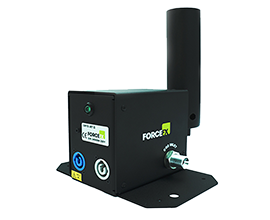 Our ForceFX Cryo Jet II's will will produce white plumes of CO2 up to 8m tall and are suitable for indoor or outdoor use, so are perfect for Clubs, Festivals, Shows and Sporting Events alike. Available to hire as individual heads with or without hoses, or as packages for your Club or Tour, we also supply 2, 4 or 6 CO2 head hire kits ready to go and with hoses and control cables to suit the size of your stage. If you need extension hoses, we also hire top quality UK manufactured 10mm thermoplastic hoses specially designed for use with CO2 Jets as well as MM joiners, MMM T-Pieces, cylinder doublers and splitters and our own specially designed ForceCon CO2 cylinder connectors. All Co2 effects are available to dry hire or with a technician. Control can be either via DMX or via our 2 or 4 channel effect controllers. Our CO2 Jet Hire kits are perfect for those wishing to Dry Hire. Available in, 2, 4, 6 or 8 head kits, our CO2 Jet hire kits come with the latest specification ForceFX Cryo Jet II CO2 heads, 10m Thermoplastic hoses with ForceCon Co2 Cylinder Connectors, 10m control leads and either a 2 Channel or 4 Channel ForceFX EC-2 or EC-4 Effect Controller with Safety Key and Fire Button. Kits can be tailored to your requirements and we can also supply them with either our 2 or 4 channel DMX switch Packs and/or a small 24 Channel DMX Desk, extension hoses and cylinder doublers and splitters, as well as truss clamps and safety cables should you need them. Should you prefer a technician to install and de-rig the equipment, or to operate the equipment at your event that's no problem. Available to hire as individual units with hose lengths from 3-10m. We also hire and supply full backpack kits and re-fill rigs, making our guns ideal for stilt walkers, robot suits, dancers as well as for promo use and for CO2 parties. 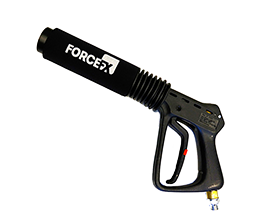 CO2 Guns are available to dry hire.